Metro Manila has an active hospitality scene. These days, hotels have sprung so quickly almost to the pace of how food parks dominated every corner of the city. And just like food parks, hotels are faced with the enormous task of keeping the hype consistently high. For a hotel to survive in such a busy and competitive industry, what does it really take? Jinjiang Inn Ortigas embodies every answer to the all important question. The seemingly humble facade of this low rise building has so much more to offer beyond what meets the eye on the outside. Entering the lobby, I was drawn towards the minimalistic and rather simple layout that the hotel has. For one I thought it is because most of the hotel's guests are Chinese businessmen, hence the simple and classic look. But then I realized, does a hotel really need to be granduer to dominate the market? I stayed at Jinjiang Inn beating the common genre of business traveling that the hotel has always warmly welcomed. I stayed with the pure desire for leisure in the quest of finding out whether Jinjiang Inn Ortigas is able to meet my expectations. Jinjiang Inn Ortigas did not disappoint. Entering the lobby alone already gave me an instantaneous feeling of traveling overseas, something I always look for in a staycation. Chinese newspapers and monitor screens in Chinese character somehow gave an international vibe. Entering the room was a pleasant surprise, it appeared like a high quality hotel room with a good amount of space to move around. The room boasts a classic look that compliments the lifestyle of both business and leisure travelers. From that alone, Jinjiang Inn has already proven me what I have been wanting to know. But I wanted to see further. I am very critical to the extent of being nitpicky when it comes to the bed and linens, it is afterall what a hotel is all about. Looking closely on the sheets, it is apparent that Jinjiang Inn is comparable to five star hotels considering threadcount and texture. In an honest opinion, I think Jinjiang Inn has one of the best pillows I have every tried among other hotels. The width and the plush profile of the pillows are something I took delight with. The mini bar list has a very decent price tag which is something I can only hope other hotels would follow. The toilet on the other hand is highly commendable for its cleanliness with an impressive sliding door to maximize the space. It is equipped with all the essentials one would find for a high-range hotel: a hair-dryer, bath robes, a complete set of toiletries and a pair of slippers. One can easily tell that the rooms are modern and has a fresh and bright ambiance. But more than what is seen, it is important to know what is felt. The quality of the room is considered paramount to paying the price of a four star hotel albeit Jinjiang Inn takes the effort to offer you a much more lower cost. The feeling of staying at a superior accommodation is definitely present without being too overwhelmed or intimidated. On another note, the breakfast buffet at the Five Spices located at the hotel's ground floor offers a variety of continental food and Asian favorites such as dimsums. After all, it is a Chinese hotel chain. As a matter of fact, one should not miss the restaurant's dimsums, it should even be considered a staple! Other than the buffet that the restaurant offers, they also offer an exciting menu of Asian cuisine which is definitely one reason to keep coming back to - and yes, they do have alcohol too. Overall, Jinjiang Inn Ortigas has satisfied every checkmark on my list. While it serves the community of businessmen very well, they are not boxed in this certain category. In fact, Jinjiang Inn was able to graciously made my staycation worthwhile. 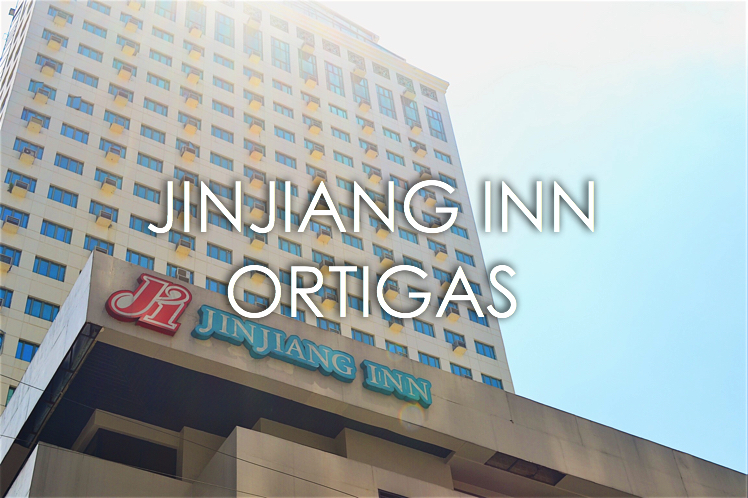 It might not be the tallest in Ortigas, but Jinjiang Inn is definitely reaching greater heights!